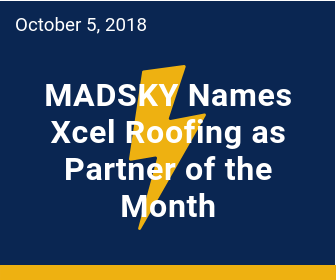 ENGLEWOOD, Colo., October 5, 2018 (Newswire) - Xcel Roofing, a member of MADSKY's Lightning Preferred Network of MADSKY MRP, has been named MADSKY's October Partner of the Month. Utilizing the MADSKY Value Proposition for contractors, Xcel has made MADSKY a part of its daily business by adhering to, and exceeding, the expectations and standards set forth through carrier relationships. Named a Lightning Preferred Contractor in Autumn of 2017, Xcel Roofing continues to utilize MADSKY's partners and vendors to grow their business and maintain the highest standards of customer service and quality workmanship. As the roofing industry continues to solidify its relationships with insurance companies and meeting their standards, Xcel has found this to be almost effortless by partnering with MADSKY. Xcel has maintained success by adhering to MADSKY’s goals for sales, closing 70% of all leads. Xcel Roofing production team has a proven track record completing jobs on time (or ahead of time) and offers its homeowners a 3-year Workmanship Warranty on all work completed. By offering numerous home improvement trades, Xcel is also a leader in assessing the entire home for MADSKY. Their customers work with a live, local Project Manager, getting the most out of their claim and seeing options for the entire home. Their passion for customer service has earned Xcel Roofing a reputation that any homeowner can trust and MADSKY stands behind. Xcel Roofing is a Lightning Preferred Contractor with MADSKY MRP. Xcel is corporately located in Omaha, NE, and has locations in Lincoln, NE, Grand Island, NE, Kansas City, MO, Sioux Falls, SD, Sioux City, IA, and Des Moines, IA. Owned by Jim Harding and Matthew Priester, they work to continuously elevate the standards of the roofing industry and bring customer service to a new level. BBB accredited since 2001, Xcel boasts an A+ rating with the Better Business Bureau. About MADSKY MRP LLC: MADSKY is the first roofing-focused managed repair program (MRP) in the country, providing access to unmatched pools of vetted and trained professionals across the roofing repair process. MADSKY’s “network of networks” is the largest collection of roofing contractors in the U.S., consisting of more than 3,000 certified roofing contractors and a supplier network of more than 3,600 across all 50 states. MADSKY’s proprietary Friction-less Customer Experience (FCX) connects the carrier, contractor and consumer, allowing for seamless communication and optimal utilization of all resources. Headquartered in Englewood, Colorado, MADSKY is quickly redefining and enhancing the insurance claims experience for roof repairs and/or replacement.